Back in April, I made limoncello as part of my 28 Recipes before my 28th Birthday. Of course, after making the limoncello I realized I had absolutely no idea what in the world I could do with it. 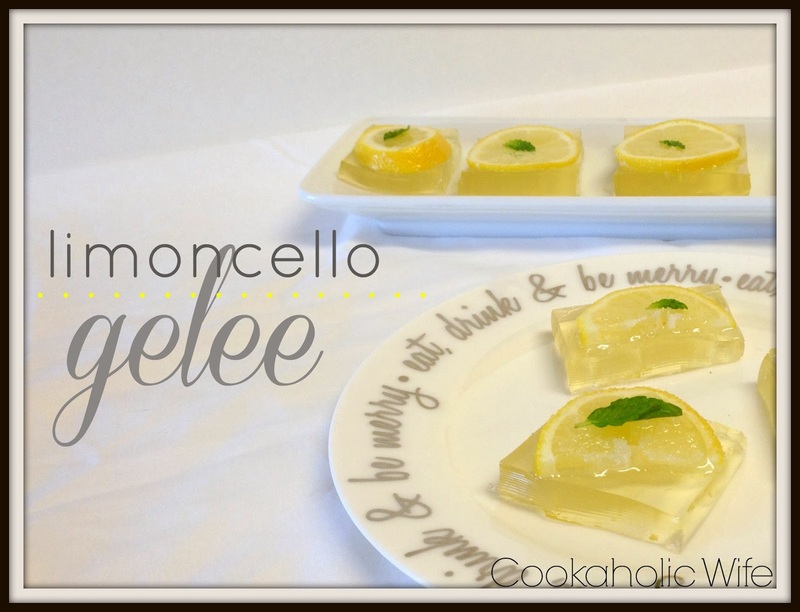 Then right before the holidays I was looking around on Pinterest and I found a few recipes that used limoncello and I immediately knew I had to add something to the Christmas menu so I could finally use up some of the limoncello! While I printed out about 5 recipes and I have one planned to make this weekend, I opted for these gelees for Christmas because they’re something I’ve never made before. Plus saying that you’re serving alcoholic jello for Christmas is kinda cool. 1. Add water to a small bowl. Sprinkle gelatin over the water and allow to sit for 5 minutes. 2. In a small saucepan, combine limoncello, Prosecco, sparkling water and sugar over medium heat. Stir with a whisk until the sugar dissolves, then add the gelatin into the saucepan and whisk until the gelatin dissolves. 3. Pour the mixture into a 8×8 baking dish, cover and refrigerate for at least 45 minutes but preferably overnight. 4. Cut into 10-12 squares. Add sugar to a small dish. Place a lemon slice in the sugar and toss to coat. 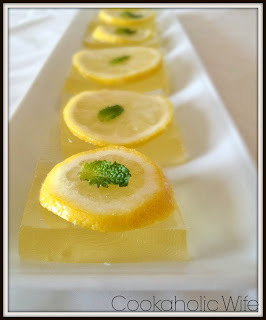 Place the lemon slice on top of the gelee and then add a small mint leaf for garnish. Knowing my family is not a fan of the tart instead of sweet desserts, I opted to increase the amount of sugar from 1/4 to 1/2 of a cup. The gelees were still just mildly sweet and sucking on the sugar coated lemon after each bite of the gelee helped to even out the tartness. Thanks – These look great for New Years- I love limoncello.